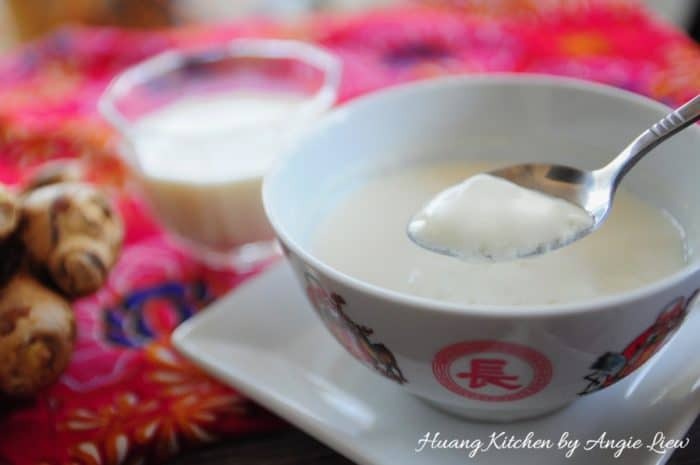 Ginger milk custard is a very popular sweet Chinese dessert made with ginger juice, fresh milk and sugar. It’s such a delightful dessert. It is super soft. light and has a luscious almost silky and velvety texture. The heat from the ginger makes the dessert so soothing and warm. It is a wonderful dessert which you will love after the first taste and you will be craving for more, that I can assure you. The amazing part about this ginger milk custard is there is no steaming or baking involved in making the dessert. The warm milk, will be able to curdle into a custard just by adding some ginger juice. 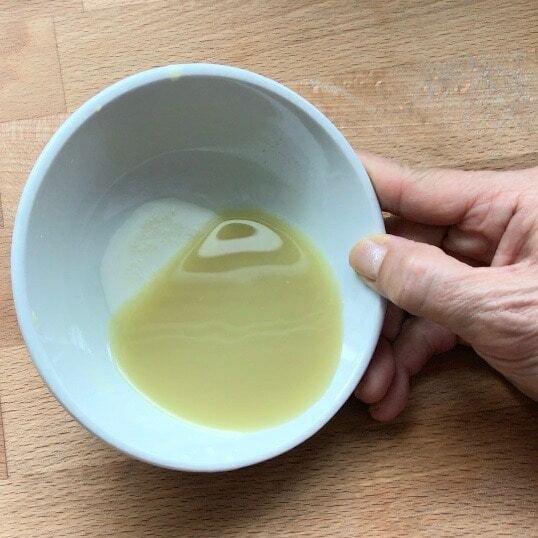 Hence, there is a need to ensure the ginger juice extracted when set aside in a bowl, contains a white layer of starch which settles at the bottom. This starch or enzyme acts as a natural coagulant to solidify the milk when the milk hits the ginger juice. If no starch is present, you may need to look for other ginger to juice before proceeding. Also, the temperature of the milk is very important. You need to heat the milk till it smokes or hand hot before adding to the ginger juice. If the milk is too hot or too cold, it will not set. Last but not least, the techniques involved in adding the warm milk to the ginger juice is also crucial to the success of this sweet custard. Give the ginger juice a good stir just before adding the warm milk. Pour the milk in one go from a height above the bowl to ensure the milk and ginger juice are well mixed when the milk “crushed” into the ginger juice. Be sure not to stir or even move the bowls. 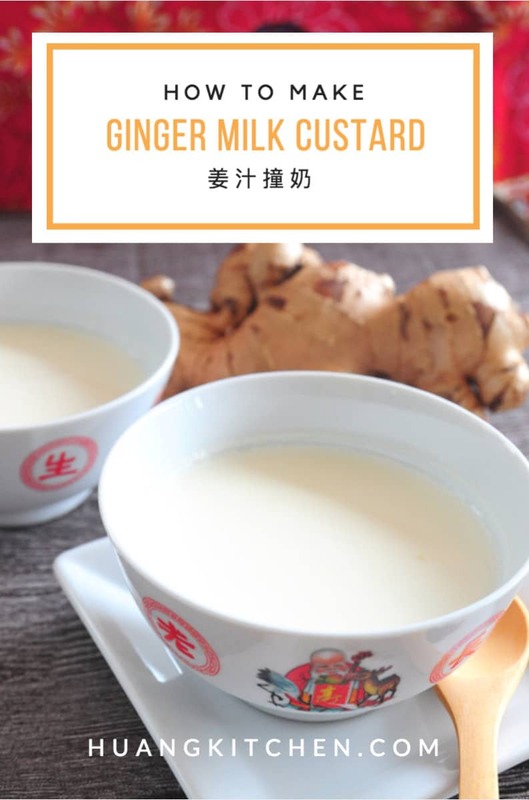 The enzymes in the ginger juice will gently curdles the milk, thus creating an ultra soft custard within minutes. Just like magic, your guests will surely be impressed. 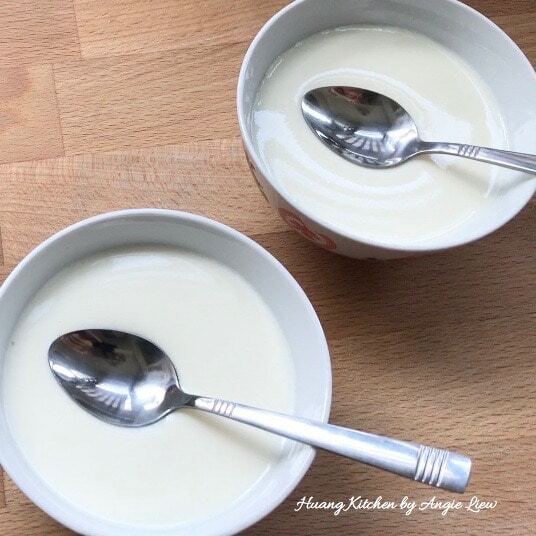 Its unbelievably easy to make this popular chinese dessert! No steaming needed, simply combine the milk mixture with the ginger juice. And you'll have a bowl of silky smooth ginger milk custard! The secret is the starchy residue found in old ginger juice! First, wash and peel the skin off the ginger. 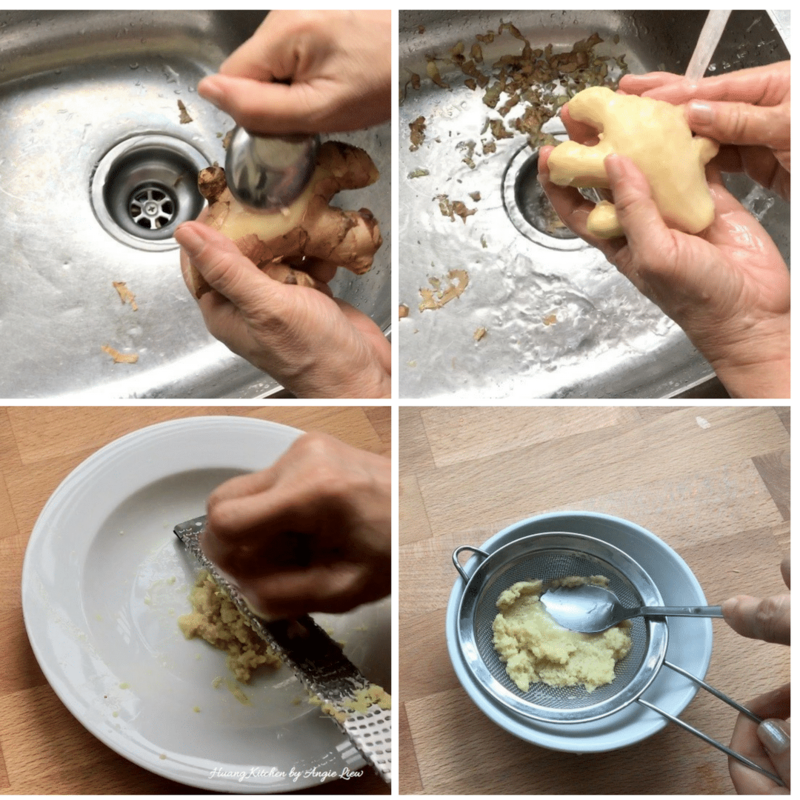 Then grate ginger and juice it by pressing the grated ginger through a fine sieve. Make sure that the ginger juice has starch in it. Stir well the ginger juice and place 2 teaspoon each of the juice into the serving bowls. Next, place milk in a saucepan Place milk and sugar into a saucepan and heat over low flame. Stir to make sure sugar is dissolved. Heat till just smokey and remove from heat. Just before pouring the milk into bowls, give the ginger juice a good stir. Then, immediately pour milk from a height to fill about 3/4 full. When milk has been added, DO NOT stir or move the bowl. Wait for about 5 to 10 minutes and the ginger milk should be curdled. This delectable dessert can be served at room temperature or served chilled. They taste equally good. So Enjoy! Choose mature or old gingers which contains a starchy content that is good for curding the milk. 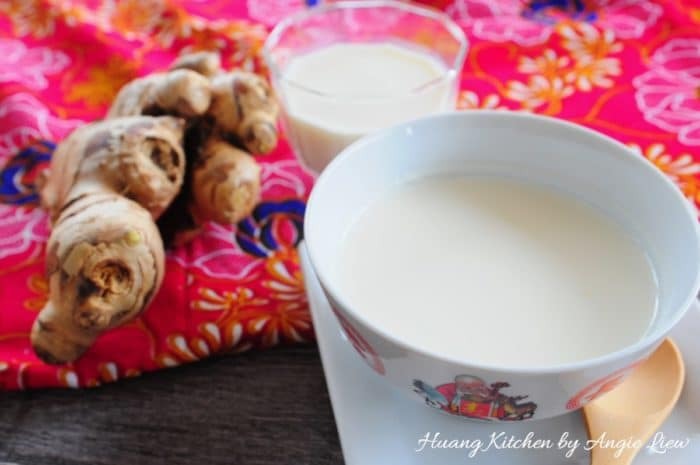 The milk should be heated to an optimum temperature somewhere between 75 to 80 degree C (just when it begins to smoke) for curding with the ginger juice. Too hot or too cold, the milk will not be able to set. 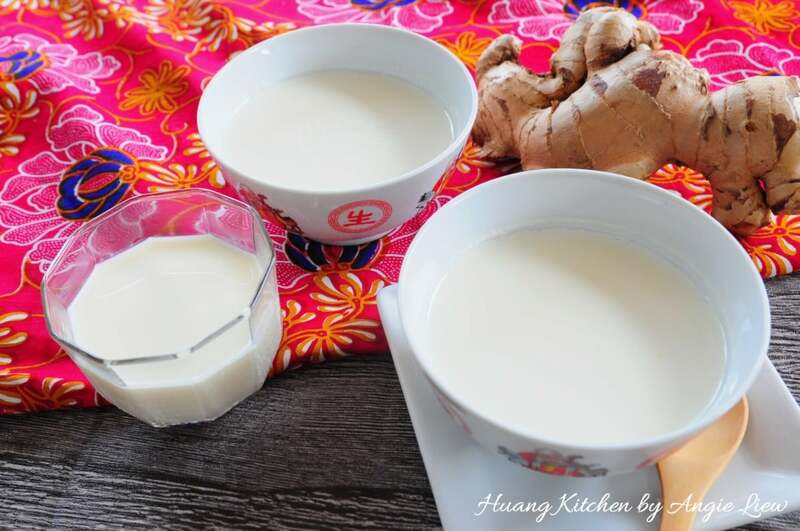 Be sure to give the ginger juice a good stir in the serving bowl before pouring the milk to make sure the starch is mixed well with the ginger juice. Pour the warm milk from a height to ensure the milk and ginger juice are well mixed. Do not move or shake the serving bowls once the milk is added into the ginger juice to set.